" Let Aaron’s Save the Day! " Interested in hiring professional and licensed electricians in Houston, TX? Protect your home, business, and yourself with all of the necessary electrical services you need in the Houston area. We provide electrical repairs and new installation for both residential and commercial customers, as well as generator and surge protection services. Our locally owned and operated business offers a lifetime warranty, and we provide a 100% customer satisfaction guarantee, as well as 24/7 emergency service. We accept all major credit cards and offer a wide variety of coupons to save you even more money. Contact us for electrical contractors in Harris, Fort Bend, and Montgomery County, Texas. Call us today at (832) 702-4263! 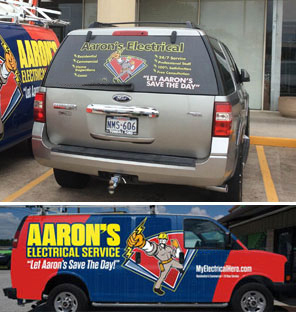 Call Aaron’s Electrical Services at (832) 702-4263 to schedule your service today!